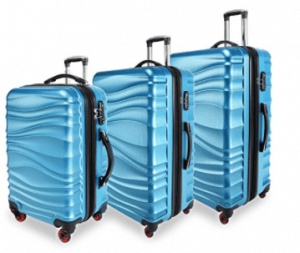 Yuting 789144 is a three-piece deluxe hardshell expandable spinner alloy luggage set with a modern design and textured finish. The set is made up of three functional, reliable and durable bags and the customer reviews are mainly positive with some negatives reported. You can get it in either black, blue or silver with silver costing ten dollars more at the time of this review. The main features that set this apart from the competitors are the solid and lightweight polycarbonate and ABS materials used, aluminum trolley and the removable wheels. The bags are built quite sturdy and durable yet lightweight to help you not go over the weight limit. With the PC and ABS material used and nice textured surface, it is better resistant to impact, pressures, and scratches. 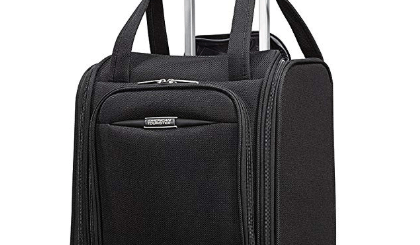 The suitcases in the set have the 360-degree rotating spinner wheels that are easily maneuverable and roll quietly and smoothly in each direction and easy to replace. They have the solid and removable 3-step aluminum telescoping handles with an upgraded handle design. The locks on the side are TSA-compatible and can be opened by the TSA (Transport Security Association) staff at the airport without having to damage the lock for checking the contents. Please see the product page through the links here for the TSA lock instructions. There are soft side handles on the side and the top and you can lift them easily by holding horizontally and vertically. Inside you have the zipped section on one side with a dirt and odor resistant lining cloth, a mesh pocket about half the size of that and two more smaller pockets that you can fit in your iPad or small items. And the cross straps on the other side to keep your clothes in place. All three bags have dual zippers and can be expanded by about 15 percent more to fit more of your stuff in. They are all lightweight despite the hardshell, the smallest cabin bag weighs 6 pounds and measures 21 x 13 x 9 inches including the wheels, medium 24” bag weighs 7 pounds and measures 25 x 16 x 10 inches and the largest 28-inch suitcase is 9 pounds with the dimensions of 29 x 19 x 11 inches. And you’ll be less likely to go over the weight restrictions and not pay extra. These bags are suitable for use in your business and leisure travels. They are shipped fitted into each other and this makes them easy to store. 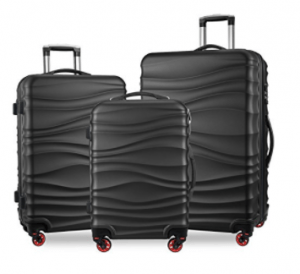 The Yuting Deluxe Luggage Set is offered with two years of warranty that covers refund or free exchange. The company guarantees hundred percent customer satisfaction and a customer support available for 24 hours and 7 days a week. You can take the 20” cabin bag onto the plane and put it in the overhead locker. You need to check in the 24” bag before your flight as it will be too big as cabin bag and the largest 28” is suitable for consignment or being checked in. This set is nice looking with beautiful colors, functional, comfortable, reliable, durable and affordable- good value for money.